SANTA MONICA, California, January 23, 2013 (ENS) – A second corporation has joined the race to mine the asteroids that pass near the Earth for resources such as the platinum group metals. There are over 1,500 asteroids that can be reached as easily as the Moon, the would-be miners say. Deep Space Industries, based in Santa Monica, said Monday it will send a fleet of asteroid-prospecting spacecraft out into the solar system beginning in 2015. 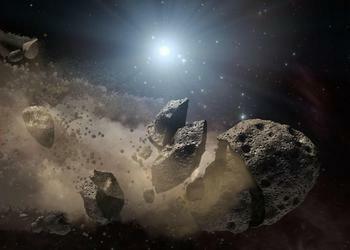 This artist’s concept shows bits and pieces of a disintegrating asteroid (Image courtesy NASA). 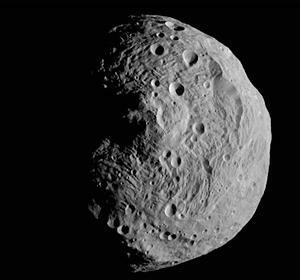 “Turning asteroids into propellant and building materials damages no ecospheres since they are lifeless rocks left over from the formation of the solar system,” said Mark Sonter, a member of the Deep Space Board of Directors. The asteroid miners’ plans have been met with skepticism by some scientists who think it will not be a money-making venture, even though platinum and gold are worth nearly $1,600 per ounce. An upcoming NASA mission, OSIRIS-REx, to return just 60 grams (two ounces) of material from an asteroid to Earth will cost about $1 billion. “Mining asteroids for rare metals alone isn’t economical, but makes sense if you already are processing them for volatiles and bulk metals for in-space uses,” said Sonter. In September 2012, the NASA Institute for Advanced Concepts announced the Robotic Asteroid Prospector project, which will examine and evaluate the feasibility of asteroid mining in terms of means, methods, and systems. Deep Space is already exploring the production of fuel for communications satellites. Low-cost asteroid propellant delivered in orbit to these satellites will extend their working lifetimes, with each extra month worth $5 million to $8 million per satellite, the company estimates. Mars missions would require fewer launches if the fuel produced from the volatile materials in asteroids were added in space. In a decade, Deep Space hopes to be harvesting asteroids for metals and other building materials to construct large communications platforms that would replace communications satellites, and later, solar power stations to beam carbon-free energy to consumers on Earth. For now, Tumlinson says Deep Space will build a small fleet of Firefly spacecraft using innovative miniature technologies. The FireFly spacecraft utilize low-cost CubeSat components and get discounted delivery to space by ride-sharing on the launch of larger communications satellites. Deep Space plans to launch the first Fireflies in 2015, sending the 55 pound spacecraft on journeys of two to six months. Starting in 2016, Deep Space plans to begin launching larger spacecraft, 70-pound DragonFlies, for round-trip visits to asteroids that bring samples back to Earth. The DragonFly expeditions will take two to four years, depending on the target, and they will be designed to return with 60 to 150 pounds of material. Tumlinson has a history of firsts in space. He signed up the world’s first space tourist, led the team that took over the Mir space station, was a Founding Trustee of the X Prize, and Founded Orbital Outfitters, the world’s first commercial space suit company. But his is not the first asteroid-mining commercial venture. The other, Planetary Resources, Inc. announced its proposals last April. Based in Seattle, Planetary Resources is backed by Google’s co-founder billionaires and Ross Perot, Jr.
A single 500-meter platinum-rich asteroid contains the equivalent of all the platinum group metals ever mined on Earth. “Many of the scarce metals and minerals on Earth are in near-infinite quantities in space. As access to these materials increases, not only will the cost of everything from microelectronics to energy storage be reduced, but new applications for these abundant elements will result in important and novel applications,” said Peter Diamandis, MD, co-founder and co-chairman of Planetary Resources. Water-rich near Earth asteroids could facilitate deep space exploration, providing space-sourced fuel and water to orbiting depots. “Accessing water resources in space will revolutionize exploration and make space travel dramatically more economical,” say the Planetary Resources executives. Planetary Resources is now at work on Leo, the first private space telescope. Planned for low Earth orbit, it is to be a stepping-stone to the near-Earth asteroids. Both companies plan to utilize CubeSats – cubes as small as a 10cm per side and 2.2 pounds in mass – developed about 10 years ago at California Polytechnic State University and Stanford to standardize getting university payloads into space. Each of Planetary Resources’ Arkyd 100 spacecraft, currently in development, will be able to host and deploy a CubeSat payload. Both companies plan to involve the public, offering opportunities to share launch viewing, for instance and, of course, the opportunity to invest. “The Google Lunar X Prize, Unilever, and Red Bull each are spending tens of millions of dollars on space sponsorships, so the opportunity to sponsor a FireFly expedition into deep space will be enticing,” said Deep Space CEO David Gump, who produced the first TV commercial shot on the International Space Station for RadioShack. “The public will participate in FireFly and DragonFly missions via live feeds from Mission Control, online courses in asteroid mining sponsored by corporate marketers, and other innovative ways to open the doors wide,” he said. Gump says bringing back asteroid materials is only a step on the way to much bigger things for Deep Space. The company has a patent-pending technology called the MicroGravity Foundry to transform raw asteroid material into complex metal parts. The MicroGravity Foundry is a 3D printer that uses lasers to draw patterns in a nickel-charged gas medium, causing the nickel to be deposited in precise patterns. Mars missions would be safer with a MicroGravity Foundry on board to print replacements for broken parts, or to create brand new parts invented after the expedition was on its way, the Deep Space executives say.